Willy Decker's production of Die tote Stadt has been seen in opera houses across the world having begun its life at the Salzburg Festival in 2004. Other performances include Barcelona, Vienna and San Francisco. There are seven performances soon at the Royal Opera House, Covent Garden. In this opera, adapted from Georges Rodenbach’s novel Bruges-la-Morte (Dead Bruges), Stephen Gould sings Paul who is locked in the grip of his memories of his dead wife. 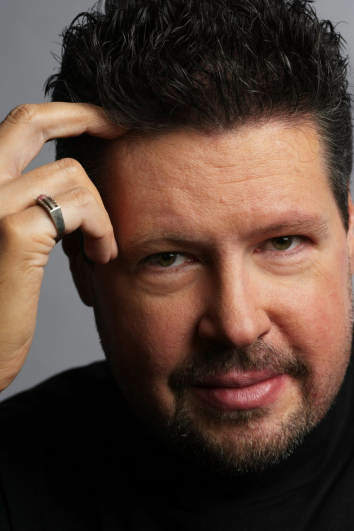 Stephen Gould is one of the most sought after tenors of this generation and critical praise greeted his debut as Florestan in Fidelio in Linz in January 2000 and he quickly emerged as one of Europe leading heroic tenors. We met just after rehearsals began for the UK première of the rarely performed Korngold opera. I had read somewhere that Die tote Stadt was ‘an opera of our time’ and something that in these difficult times could offer us some ‘catharsis’. I wondered whether Stephen considered the 89 years it has taken to get its first UK stage performance has been worth the wait. I think that is an astute observation about the opera. A lot of people however do think it is somewhat dated but I don’t think so unless you play it straight maybe the way Korngold’s father who wrote the libretto would have wanted it. For me it is fascinating because it came after the turn of the century where there was a completely new awakening of psychoanalysis with Siegmund Freud and all these sort of people began looking for subconscious reasons why lives play out the way they do. I guess it was the age where people started moving away from superstition and a fatalistic view of how life is to what exactly in our past has brought us to this point. With our twenty-first century mentality many of us are used to psychotherapy and looking back – we are the way we are because our parents did this to us or we are this way because we cannot let loose of this despair or this fear – and so I think it plays very much as a modern piece, you could almost think of it as the Viennese version of EastEnders (laughs loudly). Despite not wishing to sidetrack too much from Korngold, this comment intrigued me and I had to ask how he knew about EastEnders. I have always been fond of British programmes and the PBS output was something I relied on in New York when I was young and studying there. Yes, I can get hooked on soap operas just like everybody else. The secret to soap operas is that they are extreme but because they are played out in the sense of the real – the normal – we can believe in them. Sometimes we see operas and we are taken to a different time or a different place or then we have deconstructionist operas where it plays as modern from the very beginning and these are people we can understand. As Paul does in Die tote Stadt you can understand someone losing someone or may be even killing someone yet idolising them and putting them into a dream world where their entire life becomes trapped in the past. So I think this opera is a very modern piece and I am surprised it has not found, from time to time, a stable place in the repertory. I thought this might be because it is not easy to find the singers with the voices to do justice to the music. Indeed it is fiendishly difficult for the two leading singers. The tessitura is brutally high at times and I would say it is very much like Strauss which is quite ironic since Korngold’s father as a critic was as ridiculously harsh on Strauss as he was on his son who he incidentally never believed was a success. Korngold was young and ambitious and he threw everything he knew into composing this piece and the orchestration is a little exuberant shall we say. I think if he had composed it or reworked it later in his life he might have chosen a few different orchestral colours to make it a little easier to combat the orchestra when we are singing. Having said that I am convinced it is well worth hearing. Because of the war Korngold left Austria as we know and went to California and decided to compose other things so it is perhaps because he doesn’t have a body of work in the opera genre that is one of the reasons Die tote Stadt is so overlooked. Is Korngold the ‘Viennese Puccini’ as some have named him? Well I actually do think that as he wrote some indescribably beautiful vocal lines in the music. In his songs – some of which I have recorded – is where you begin to hear some of his real genius and, of course, his orchestrations are just legendary. People thumb their nose because he eventually did just film music but if you listen to some of it it is more opulent, extravagant and beautiful than many symphonic pieces that have been written. There are indeed a lot of Puccini-esque moments. I think he was extraordinarily connected to the passion of the music. This may be another reason why his work did not come into the canon because one has to realise that at the time he was composing it was still the end of the Puccini era and that of many of the impressionists in music and then there was Schoenberg and Berg moving off into an entirely different style of music. I think such Puccini-esque music at this particular time – shortly after the death of Puccini particularly – fell out of vogue and people considered the master was dead so let’s do something else. How does Willy Decker’s version of Die tote Stadt that you first did in Vienna in 2004 compare with the other production you sang in at the Deutsche Oper conducted by Christian Thielemann earlier the same year? Willy Decker gives us a slightly more positive ending than is sometimes done and we never know whether Paul fades into despair or does he finally make a break with his past and go forward in life. At least that is my approach and when I leave the stage I want to give the impression that he is trying for a new beginning as opposed to having him descend into despair because his life can never be happy. When I worked with Willy Decker in Vienna it was the first time I had worked on a new production from the beginning and the brilliance of his idea is that you can never recognise the point when it actually becomes Paul’s dream yet by the time we have the surrealistic dream sequence with his friend Frank we know we have clearly entered Paul’s psychosis. In Berlin we sang every note of music, there were no cuts, and I liked the production though it came across as a more surrealistic piece. I think there are many way to play the opera and many people will know the legendary Götz Friedrich staging, that preceded the one I did in Berlin, which was severely cut – almost too much for my taste – yet it came over as more realistic and was brilliant in its own way. It is an opera that can hold up against such extreme differences of interpretation and has proven itself to be a classic. The cuts here are not so extreme as the Götz Friedrich one that first brought this opera back to Central Europe when no one was putting it on at the time which was 35 to 40 minutes shorter than here at Covent Garden. The most cuts made here are in some orchestral music so that the first and second acts can be merged. Ingo Metzmacher will conduct these current performances. Had they worked together before? I have known him for a while of course by reputation and I have seen him conduct a few times but we are working together for the first time, the work we have done so far is very exciting and I am really looking forward to the performances when they start. He is very expansive and receptive to the singers and that is really quite nice and so we have a lot of more breathable lines than perhaps with someone else, such as, Christian Thielemann. Though with him since we were doing every note of the opera I was very glad there were moments when Christian kept things moving as fast as possible so we could just get through the whole thing. I asked whether he was from a musical family and how did he decide to become a singer. My mother was almost a concert level pianist and my father was a Baptist minister with a great natural voice – he never had any training but could sing and speak to 300 people without a microphone and be heard. My mother was a great operetta fan so had The Student Prince and all the Lehár things playing in the house. My mother was not a great singer but my sister and I were a quartet with my parents and my dad and I sang a lot together in church, in fact, we sang all the time in church. I was doing amateur dramatics and musicals in high school when one day my teacher told me she thought I had a good voice and should go and study with her ex-husband. He was an excellent first teacher to have and he was a member of the Norfolk Savoyards so I fell in love with Gilbert and Sullivan and my first significant role was as one of the three hulking brothers in Princess Ida and through that I saw my first opera when I was 17. I’d always loved classical music and jazz but never considered singing as a career and I was already in university before I switched but I did a lot of musical theatre just to make ends meet. Because of the nature of my voice I tried to be a dramatic Rossini tenor and that worked for – I don’t know – about 14 months (laughs) and then the voice started having a lot of problems because it wasn’t the real voice for me. I was a student at the Lyric Opera of Chicago Centre for American Artists at the time and what they were wanting me to do in that repertoire was just too high and I didn’t have the technique for it and I wanted to go back to baritone. Unfortunately the opera world didn’t need another lyric baritone of my physical and vocal size so I auditioned as a lark for The Phantom of the Opera and I ended up doing that for seven years. Could it really be true I asked that he had appeared in about 3000 performances of musical theatre? Yes that is about right and the majority of them are Phantom and I look back at that and think it is staggering that I could have been in it that long. I never sang the Phantom or Raoul but I did almost every other male role in it at one time or another. After about 10 years of this sort of work – 8 shows a week and all that travelling – I didn’t see any way to get back into opera. I had tried several famous singing teachers over those years and many were very good at polishing voices but not building them. It wasn’t until I met John Fiorito who had I met 10 years earlier I could have done a little bit more Italian repertoire and then maybe Wagner much earlier. He really changed my life and told me I was going in the wrong direction and that if I wanted to get back into opera I would have to stop performing and just work for 2 to 3 years with him and that is what I did. I got a day job and studied in the evenings for 3 years and he is the one who steered me towards my German Fach. So how did he get from performances of Phantom back to singing opera in Europe? Well I was offered a fabulous job in the US that I wasn’t going to be able to turn down and as I was 37 John said it was now or never. I spoke no German and came to Europe to do auditions for 6 weeks. It was June when I was auditioning and all the opera houses usually have their ensembles already set for the following season by then. It became a fait accompli and I was offered a job in Linz and I spent 2½ years there. I thought maybe they will hire me for Fidelio and give me a Fest contract for the following season and I could go back to New York and improve my German. However they surprised me by saying that I had to be there in six weeks. So back I indeed went and packed up my entire life and was suddenly in Austria with nothing more to help me than Hochdeutsch tapes but nobody had warned me that they don’t speak this type of German in Austria (laughs). So it was quite a shock as I had to be there by the end of August and then did not sing my first role as Florestan in Fidelio until the following January. In some ways it was also very good and gave me the opportunity to start getting into the system. What was wonderful about Linz is that although it is an A house orchestra it’s really a B opera house as it has only 900 seats so it was a great training ground for me. I can’t imagine a better place because you get months and month of training in every opera; when I did my first Tannhäuser there I had musical rehearsals for almost three months and then a summer break. So I went back to New York and reworked the whole piece with my teacher, came back, had 6 or 7 weeks of rehearsals and then when it was put on over a two-year period I got 22 performances of Tannhäuser – I cannot think of anywhere else you get that preparation. Obviously Tannhäuser is a signature role and he is making his name in singing testing roles such as these ; the Florestan he began with and others such as Paul here now at Covent Garden and the Siegfrieds in the Ring cycle. I wondered how he felt about this. When you are tall and fat they tend to stick you in this stuff (laughs). When I was in musical theatre I did a lot of comedy that I loved but unfortunately with the repertoire I do now I doubt there will be anything other than Sturm und Drang. The preparation in Linz got that music into my body and into my voice and for me Tannhäuser is not really that difficult to sing. It suits me and so does Lohengrin but where really I met my match was with the Ring and the role of Siegfried. It was quite a shock to find that Wagner had created an absolutely different style of singing. On the page Siegfried doesn’t look that daunting – just long – but when I did it I realised how impossible it is to have an absolute success as Siegfried. It requires three different tenor voices, incredible stamina, and no matter how well you do it you will have two-thirds of the audience not liking you – one-third want only baritonal heft, others only want a steely sound coming out, whilst the others want an extraordinarily youthful Windgassen sound. All of them will have their favourite tenor who they believe never made a mistake and this is not true. I have to thank Wolfgang Wagner for telling me that before my first Siegfrieds in Bayreuth in 2006. I’ll never again sing my role debut at such a venue like that. Thielemann talked me into it but I soon realised that by doing both Siegfrieds for the first time in Bayreuth with the director, Tankred Dorst, who was a very sweet and wonderful man but had no idea what he was doing, there was no way I had a chance. Wolfgang Wagner to his credit saw this and his way of dealing with it was to insist on us sitting down alone one day and he just started telling me stories for almost 15 minutes – (in a heavily accented Wolfgang-like voice) ‘Max Lorenz, wonderful, wonderful man, had no rhythm whatsoever’ and things like this. He also gave me a recording of Windgassen’s first Siegfried in Bayreuth and he leaves out 8 of the high As in the forging song. He just left them out and did not sing the phrases because he knew he wouldn’t obviously make them. If I did that today I would be booed off the stage. So Wolfgang helped me a lot and it was his way of saying that all these tenors fought with this role and that I should stick with it. We all hear stories about Bayreuth but that shows its true heart. When I think about critics I remember a quote from a big German newspaper about Lauritz Melchior’s Parsifal in his first year in Bayreuth and in English it said ‘A singer by the name of Lauritz Melchior sang the role of Parsifal - it is not necessary to remember his name since you will never hear of him again’. Bayreuth is still a special place but a lot of the audiences have become almost impossible and maybe their expectations are too high after waiting 10 years for a ticket and all the expense of getting there. It’s also hard to get the best singers and the star conductors. It is still the greatest orchestra you are ever going to hear play Wagner and the chorus is beyond sublime. I learned an awful lot there. Yet one area it has gone down is in the coaching because there does not seem to be enough people there with the incredible experience that there once was. This is mainly because the opera houses don’t treat them with the respect they should because too many are being run as a business and not as Wan art form anymore – and that’s my personal belief. I believe Katharina and Eva Wagner-Pasquier will be good for Bayreuth but people must give them a chance. I won’t be going back to Bayreuth this summer though they wanted me to stay. I haven’t had a summer break to be with my family for 7 years and I also feel I have nothing more to learn from that Ring production. I’m certainly not stepping away from Bayreuth forever and we are talking possibly some things for the future. I did have a success with Siegfried in Vienna and that’s when I realised that I have to be more careful in future and that I need a very supportive director because that is part of the secret of being able to sing this piece. I wondered what opera directors he had most enjoyed working with? Unfortunately there are very few real opera directors around though Willy Decker is certainly one of them but it is his choice not to do much new work anymore. I am open-minded to modern theatre as long as the relationships make sense. I am fond of Philip Arlaud who although he does a lot of surrealistic stuff is a musician and understands singers. I like Robert Carsen though a lot of people do not – in the Tannhäuser I did with him we are painters not singers but those relationships made sense and at least the scenes where we were showing our paintings was symbolically correct. He definitely had something to say and helped me with some new thoughts about this role that I have sung almost 70 times now since my first Tannhäuser in Linz; that was with Stefan Herheim who is also someone I like him very much. Unfortunately also, too many directors these days disregard the voice and think that any limitations that this places on their work is wrong. Well opera is not straight theatre and if it was surely we would not need the music? Domingo for instance can ‘say’ more by standing still with one look and certain colour in his voice than many people on the stage can do in an hour. Our time near an end, I wondered what he would most like to sing in the future and was most looking forward to. I’m still searching for a role that I know for 6 years has suited me to a tee and that is Samson in Samson et Dalila but that is hardly ever done and then when it is it is for one of the special tenors. Recently it was Jon Vickers and then Domingo took over the mantle and occasionally José Cura does it. Unless you are famous enough to get an opera house to do it for you it is not done very much. I want to do Captain Vere in Billy Budd one day and I’m looking forward Les Troyens at the Deutsche Oper in Berlin in 2011. I think as far as Wagner roles are concerned that Tristan is the end of the line so to say. I think it will suit me better than the Siegfrieds did. Okay so it is a condition thing especially to get through that third act but Wagner also gives you these beautiful lines and you can get your voice under it. With Siegfried it is difficult to do that because you are often spitting out text as fast as you can. I’m doing this the right way this time, I’ll do my first Tristans as complete concerts in Brazil with a good orchestra and conductor and Violetta Urmana as Isolde. Exactly two months later I’ll be starting rehearsals for six weeks at the New National Theatre in Tokyo for the first time that I’ll do it on stage in December 2010 – I’ve learnt a lot from my Bayreuth experience and I am going to get some performances of Tristan under my belt before the Germans get to hear it (laughs). And fFor information about performances of Die tote Stadt at Covent Garden (Stephen Gould sings Paul at most performances) in February and March see www.roh.org.uk.